Published by: Sterling Publishing Co. Inc. Being a total novice at veneering, I found this book an excellent choice for the beginner. It appears that those with more experience would also gain some insight into some of the finer points of the art. Each chapter is well written with clear step by step narrative, lots of excellent color photographs and plenty of nicely drawn detail sketches. Every step of the process seems to be quite clearly described so that anyone can successfully complete a veneering project. 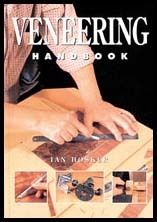 I know I look forward to my first attempt, which has been made a lot easier with "Veneering Handbook"
their thoughts, suggestions and complaints.